﻿ Is this the best time of the season for Madrid to play Barça? 02.12.2016 » Is this the best time of the season for Madrid to play Barça? The first Clasico of the season is here! Barcelona and Real Madrid lock horns at the Camp Nou in a game where the hosts will have much more to lose than the Merengues. Ready for a rollercoaster of emotions? Real Madrid take the Puente Aereo this Saturday to visit Camp Nou for the first Clásico of the 2016/17 season. The last time they played we've seen a Barcelona vs Real Madrid clash, the Merengues ran out 2–1 winners and also stopped the Blaugrana from going 40 games unbeaten. This time around, it is Real Madrid who are on an unbeaten streak of 32 games and whether momentum alone takes them past their fierce rivals will be seen on Saturday. From the outside, it looks like the best time for Madrid to play a Barça side that have struggled for consistency of late. 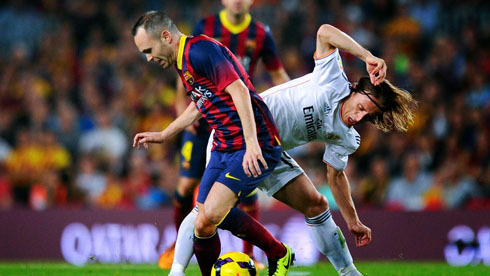 But as events of last season can attest, El Clásico results don't always follow the form book. It's worrying for Barça that they have floundered in recent matches which makes this weekend's Clásico a favourable occasion for Real Madrid to stretch their unbeaten run. Luis Enrique's side have drawn their last two league games. In both matches, they looked sluggish and were lucky to escape with a point against Real Sociedad last weekend. In contrast, Real Madrid have found a resolve to turn unconvincing performances into wins. 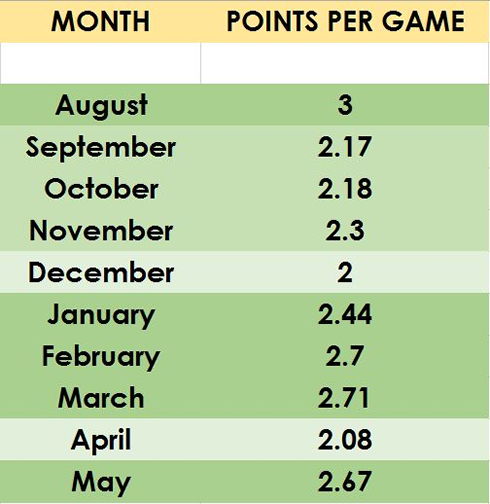 A look at Barça's points-per-game average per month in Enrique's time at the club suggests a pattern. Barça have won back-to-back titles under Enrique, but they tend to find their groove only after the New Year. In 2014/15 and 2015/16, Barça started like a train only to suffer a drop in the months of November and December, before getting back to their best in the second half of the season. This season as well, they struggled in November, collecting just five points from three games. 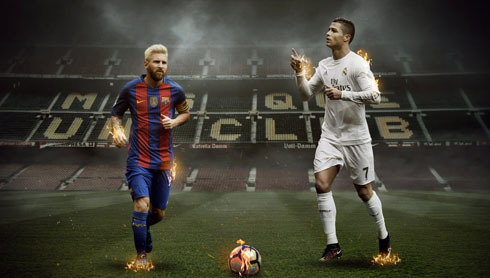 There is no reason to believe they will start as overwhelming favourites in the Clásico. Their record in December under Enrique is the worst. Barça's trend to tail off a bit towards the end of a year makes it a great prospect for Real Madrid to put their fierce rivals in further misery. A win for Los Blancos will see them open up a 9-point gap at the top of the table. Cristiano Ronaldo has scored five goals in his last two league outings, including a hattrick against city rivals Atlético Madrid at the Vicente Calderón last month. The Portugal captain has scored more goals in the Clásico at Camp Nou than at the Bernabéu, which further enhances Real Madrid's chances of a win on Saturday. With 16 goals, Ronaldo is just two goals behind Los Blancos great Alfredo Di Stefano in Real Madrid's top Clásico goalscorers. The 31-year-old is the man for the big occasion, and him being on form basically tilts the balance of the Clásico in Madrid's favour. Real Madrid manager Zinedine Zidane has faced criticism in various quarters for not being a great tactical mind compared to the likes of Pep Guardiola, or his predecessor Rafael Benitez. His simplistic approach, however, hasn't hurt his team who have enjoyed a great run under the former World Cup winner. Los Blancos have not lost a game in all competitions since April, 2016. Their unbeaten run took them to their 11th European Cup win last season, and now has them sat comfortably at the top of the league table. Despite not showing enough tactically, Zidane has managed to make Real Madrid one of the best teams in Europe this calendar year. His handling of personnel and trust in youth coupled with good results have allowed him greater leeway in a demanding job. As a consequence, he has bought more time off the Bernabéu faithful to build a side along the lines of his ideas, one that doesn't quite know what it is like to lose. Real Madrid don't play the best football in Spain, neither do Barça, judging by recent performances. But one thing that separates Zidane's men from their Saturday's opponents is that they usually get the job done. 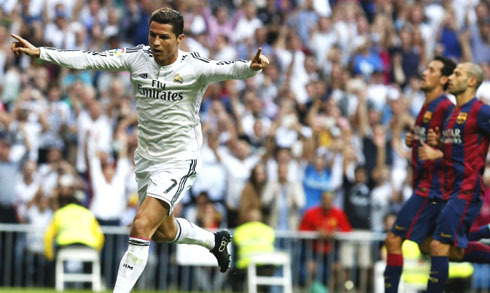 Ronaldo is back among the goals, and Barça don’t play too well in December. Almost everything suggests Real Madrid should edge Saturday’s Clásico, despite the game being at Camp Nou. It seems there hardly is a better time for Madrid to play Barça, who are far from their best at the moment. 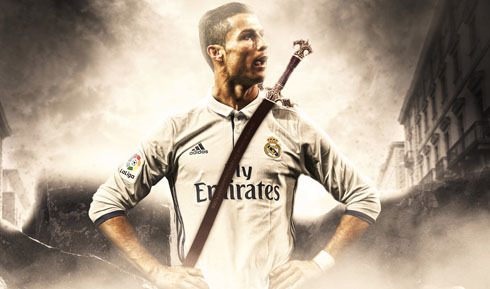 Cristiano Ronaldo next game is El Clasico for La Liga, on December 3 of 2016 against Barcelona. You can watch Juventus live stream, Barcelona vs Real Madrid, Tottenham vs Swansea City, Manchester City vs Chelsea, West Ham vs Arsenal, and Mainz vs Bayern Munich, all matches provided from our live streaming game pages.